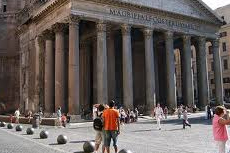 Dating back to 27 B.C., Rome's Pantheon is considered the forerunner to all modern places of worship, built in dedication to the entire spectrum of Roman Gods. Very beautiful. In a square with lots of shops- esp. meat and cheese shop!!! Must see. Be prepared for large crowds and the challenge of taking a couple photo of the Pantheon. Moved along with the crowds but had enough time to stand and read the info about Victor Emmanuel, Princess Margherita and Raphael. We saw it on our guided tour on our way to the Colosseum. We saw it on our guided tour on our way to the Colosseum. It was gorgeous and a nice place to see. The rotunda inside the Pantheon is beautiful as is all the paintings on the wall. The rotunda inside the Pantheon is beautiful as is all the paintings on the wall. Because we did this tour on our own, we did not gain additional information on the site. Beautiful building, well worth a look. Beautiful building, well worth a look. The square surrounding is very expensive for food and drink! Driver got us exactly where we needed to be quickly and had great commentary. This was part of our tour with Rome in Limo. This was part of our tour with Rome in Limo. Beautiful building, ruins and chapels. The history of this building goes back to Roman times and then converted into a Roman Catholic church. I would say a visit is a must while in Rome. Our hotel was located right next door to the Pantheon - Hotel de Minerva. Our hotel was located right next door to the Pantheon - Hotel de Minerva. No independent operator necessary. The best ancient monument in Rome. The best ancient monument in Rome. Fantastic. Go when it is raining heavily. Amazing frescoes & tainted glass! Right across from Hotel Albergo Del Senato, which I highly recommend. Right across from Hotel Albergo Del Senato, which I highly recommend. Found good restaurants in the area. Fantastic tour operator, got to be done!